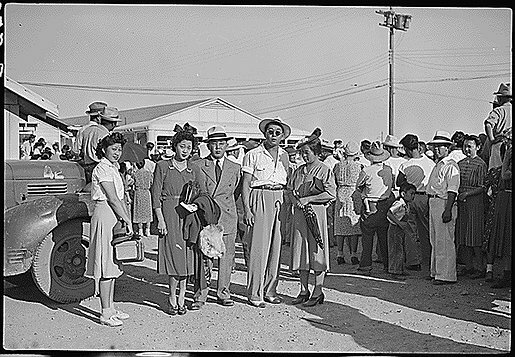 During the internment of Japanese Americans in American Concentration Camps 5,589 American citizens renounced their US citizenship. They were enraged by their treatment by the US government and/or wanted to stay with their parents who were going to Japan and/or had family commitments in Japan. Only 1,657 actually went to Japan. 2,785 approved renunciants were released from the camps and stayed in the US. 1,133 applications for renunciation were rejected or withdrawn or had moved out of the camps or died. The renunciant were from all 10 concentration camps were eventually sent to the renamed Tule Lake Segration Center. Tule Lake Segration Center had a camp in a camp with the "loyal" inmates on the outside of the inner camp. The shipment of renuncant to Japan was entwined with the prisoner exchanges between Japan and the US. The prisoner exchanges used the Swedish ship MS Gripsholm and a neutral country. For a more detailed discription of the Gripsholm voyages and the aftermath of the voyages go to Densho Encyclopedia: the Gripsholm Voyages. To obtain the reference material used by this album, see "The Evacuated People: A Quantitative Description” by the United States Department of the Interior. RoyKakuda — Última actualización Mar 10 2017 3:30 p.m.